This study aimed to evaluate the integration of a simulation based learning activity on nursing students’ clinical crisis management performance in a problem-based learning (PBL) curriculum. It was hypothesized that the clinical performance of first year nursing students who participated in a simulated learning activity during the PBL session would be superior to those who completed the conventional problem-based session. The students were allocated into either simulation with problem-based discussion (SPBD) or problem-based discussion (PBD) for scenarios on respiratory and cardiac distress. Following completion of each scenario, students from both groups were invited to sit an optional individual test involving a systematic assessment and immediate management of a simulated patient facing a crisis event. A total of thirty students participated in the first post test related to a respiratory scenario and thirty-three participated in the second post test related to a cardiac scenario. Their clinical performances were scored using a checklist. Mean test scores for students completing the SPBD were significantly higher than those who completing the PBD for both the first post test (SPBD 20.08, PBD 18.19) and second post test (SPBD 27.56, PBD 23.07). Incorporation of simulation learning activities into problem-based discussion appeared to be an effective educational strategy for teaching nursing students to assess and manage crisis events. This study was funded by a teaching enhancement grant from National University of Singapore Center for Development of Teaching and Learning to Alice Lee Centre for Nursing Studies. We thank Prof Debra Creedy, PhD, RN, for her review of the manuscript and Moon Fai Chan for his statistical consultation. Wenk, M., Waurick, R. Schotes, D., Wenk, M., Gerdes, C., Van Aken, H.K. & Popping D.M. (2008). Simulation-based medical education is no better than problem-based discussions and induces misjudgment in self-assessment. 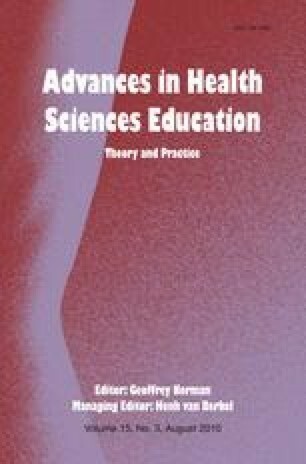 Advance in Health Science Education. Retrieved June, 20, 2008, from http://springerlink.metapress.com.libproxy1.nus.edu.sg/content/l716p3017375183n/fulltext.pdf.